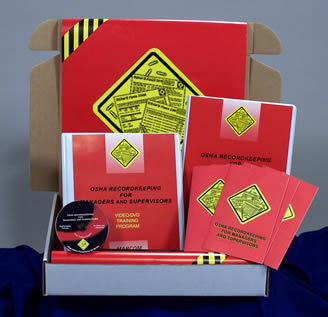 Description: MARCOM's "OSHA Recordkeeping for Managers and Supervisors" Regulatory Compliance Kit helps facilities comply with OSHA's Recordkeeping regulation (29 CFR Part 1904). It covers the details of the regulation's requirements and highlights actual workplace incidents that demonstrate what a managers' responsibilities are in documenting and reporting recordable accidents. Materials in the Kit include a Videotape Program, a Compliance Manual, five motivational Posters, and 30 Booklets. A Compliance Manual containing "fill-in-the-blank" Written Compliance Program is included. The Posters in the Kit emphasize the importance of complying with the regulation. Areas covered in the Videotape and Booklet include revisions in the regulation, why recordkeeping is important, which recordkeeping requirements apply to specific work environments, using the new recordkeeping forms, "recordable incident" scenarios, and more. The Videotape Program in the Kit can be used in conjunction with the MARCOM's Videotape Training Program "OSHA Recordkeeping for Employees" to train workers at all levels, and provide them with a common base of understanding about OSHA's recordkeeping requirements. The Videotape Training Program in the Kit comes with a comprehensive Leader's Guide, reproducible Scheduling & Attendance Form, Employee Quiz, Training Log and Training Certificate.